Built with RangeBooster G Technology, this D-Link WBR-2310 RangeBooster G Wireless Router delivers faster wireless signal rates and farther wireless coverage than most other 802.11g devices. It allows clients to always operate at the highest possible speeds while automatically identifying and recognizing other D-Link RangeBooster G products for highest performance capability. With farther wireless coverage, you can connect to the network from greater distances. This wireless router also offers total network protection from unauthorized access by online intruders and malicious attacks using Stateful Packet Inspection (SPI) technology. Network management features like MAC address filtering prevents unauthorized access, while parental control features prevent family members from viewing inappropriate content. The RangeBooster G Router also supports WEP and WPA wireless encryption. With D-Link’s Quick Router Setup Wizard, you can set up your wireless network in minutes. It also configures your Internet Service Provider (ISP) settings to quickly establish broadband Internet connectivity. The Wizard even makes it easy to add new wireless devices onto the network. This Wireless Router is backward compatible with 802.11b standard, ensuring compatibility with a wide range of popular wireless devices. You can buy D-Link WBR-2310 RangeBooster G Wireless Router here! Like everyone else, when I first installed the router I was having difficulties. I was having dropped connections, sometimes the SSID was not broadcasting, and a bunch of other stuff. I was about to re-box the thing and send it back, but I decided to fool around with the settings thinking I could not make the situation any worse. I remembered when I activated my DSL modem there was something called PPPoE. The PPPoE could either be hosted on the modem, the router, or the computer. Since the DLink WBR-2310 has PPPoE built-in I decided to turn off the PPPoE on the modem and host it on the router. Low and behold, all my connection problems went away. I was still a little apprehensive that I had found the problem, so I started a large file transfer from my notebook to desktop over the wireless connection and had two other notebooks pulling large downloads from the internet. Not once did the connections drop. Things got slow but nothing ever stopped. So, for anyone having connection troubles and they are using DSL try my example. It may work for you, it may not. I took away a star because I had to "luck-up" on finding the solution. DLink does not provide support for my modem and AT&T does provide support for the router. Terrible situation to put a customer in. 1. I've seen problems with both the WBR-2310 and WBR-1310 when updating firmware. At least the 2310 is less drastic - the firmware update web page just spins and spins and you can't tell if it's done, but if you click away from it and then click to the status page, then the update was complete. 2. I could not get Extended Range Mode to work with Hidden Wireless SSID. Whenever I selected both and saved the settings, it would return with the hidden SSID turned off. Since security is paramount, I had to forego using extended range mode. It's not fixed in the firmware 1.02. I've had too many problems overall with the WBR series, the DWL-2100, and even some DI-524s of which I used to have a high opinion. I'm going over to Netgear and Linksys for now. This is my third router, and is one of the worst ones I've had yet. I bought this less than 4 months ago, and already its locking up on a daily basis. Now I see they put out a new firmware update, so I went to put version 1.03 on my router. The stupid thing won't work at all now, please save yourself the money and do not purchase this. I gave it a 2 because when it does work, it does a good job. How hard is it to run a wireless laptop, a desktop, and an Xbox 360 without locking, apparently for DLink its impossible. 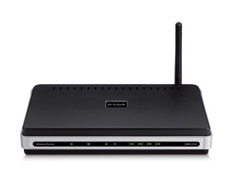 After having 2 Linksys WRT54G wireless routers die within a month and a half, I bought one of these. An awesome router, they said. The automatic setup did not work, so off to India to talk a tech. After an hour of trying everything else we hit on the the right combo of things. It worked!!! Unfortunately, it quit working within a few days and nothing would get it going again. I got this router after trying several pre-N and wireless G MIMO routers for my home. All of them had some problem or the other, including interference from cordless phones, but not this one! Straight out of the box, it worked like a charm and still going....fingers crossed! Return to top of "D-Link WBR-2310 RangeBooster G Wireless Router"! !